If you are planning a trip to the Virgin Islands (U.S. or British), The Baths on Virgin Gorda is an excursion not to be missed. It was one of the highlights of our Tortola trip! 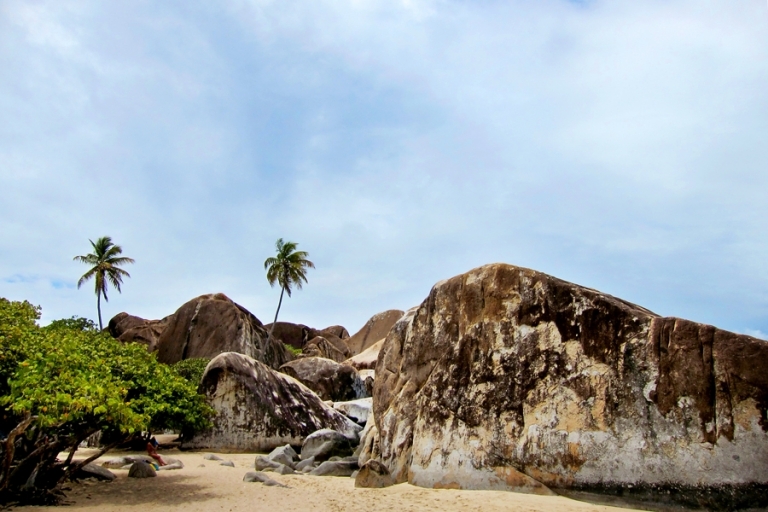 Huge granite boulders form caverns of sheltered pools along the edge of the beach, and you can hike, wade, and climb your way through the massive awe-inspiring maze. 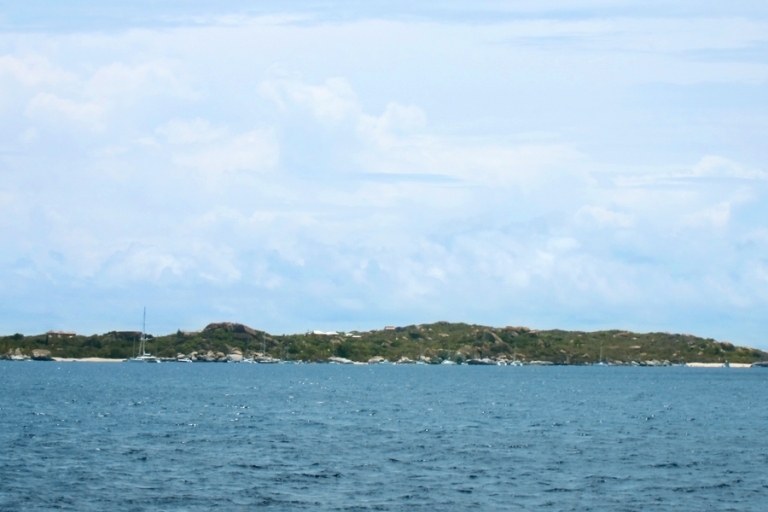 If you’re not staying on Virgin Gorda, it’s easily accessible by ferry, a tour group, or charter boat. The first time Chris and I went to St. John, I chickened out of visiting The Baths with the rest of our group because I was afraid to snorkel and for some reason I thought the caves would be dark and full of creepy sea creatures. I’m shaking my head in shame now that I know better, and I’ve learned my lesson on carpe diem-ing these opportunities. The second time we planned to see The Baths via the Bad Kitty tour after I decided I was brave enough, a tropical storm cancelled our tour. Sigh! So third time’s a charm, right? On this trip to Tortola, Chris and I were fiiinally able to see the awesomeness that is The Baths. We decided it would be easy enough to just hop on the ferry out of Road Harbor and grab a cab once we arrived on Virgin Gorda, and it did turn out to be very simple. Our ferry ride over to Virgin Gorda from Tortola was beautiful. The weather was a little cloudy that day, but happily I think it made a difference in the crowd level. We heard morning was a good time to avoid busy tour groups, so we arrived around 11am and didn’t find the caves or the beaches to be crowded at all. I had also checked the Port Authority schedule to see what day would have the least cruise ship passengers in port (we picked a day with no cruise ships in port), so that helped, too. Photography note: morning is also a great time to get the best lighting for photos. From the ferry dock we took a taxi to the top of the Baths – you can either arrange for a taxi as part of your ferry trip, or just grab a taxi waiting at the ferry dock. It was about a 10-minute ride to Spring Bay where we were dropped off at The Top of the Baths – an area with restaurant/bars, shops, and the kiosk where you pay visitor entrance fee to the park ($3 per adult). From the top, it’s a 10-15 minute sandy hike down to the caves. The trail is well-marked, you can’t get lost, and as long as you don’t have mobility issues it’s not a particularly challenging hike. I wore water shoes, but Chris did the trip in flip-flops and he was fine. And just to ease the concerns of anyone who imagines The Baths like I did, it’s not creepy. I promise. The caves are nice and bright, and the water is no more than waist-deep (I’m 5’7″) in most spots, free of any sea creatures. Also, the boulders are so huge and tall that I didn’t feel trapped in a small space or anything. There are a few tight areas, including one that you have to crawl through to enter the caverns (see photos of us in the crevices below for perspective), and there’s a bit of an incline climb towards the beginning that requires assistance of a rope “rail,” but other than that, this isn’t a super physically demanding activity. If there’s anywhere you can make it look like you’re starring in an Indiana Jones movie though, this is it! I hate saying this since I’m a photographer, but photos just don’t do this natural phenomenon justice. You really have to be in the caverns to understand the scale of these massive boulders. There are plenty of tour groups that offer guided tours of The Baths, but it’s something you can see on your own if you don’t want to go with a big group. We didn’t have guides, and well…full disclosure, we did get a little lost for a few minutes, but that’s only because we climbed up out of the caves and on top of the boulders and sort of wandered off the beaten path. Obviously we found our way out! 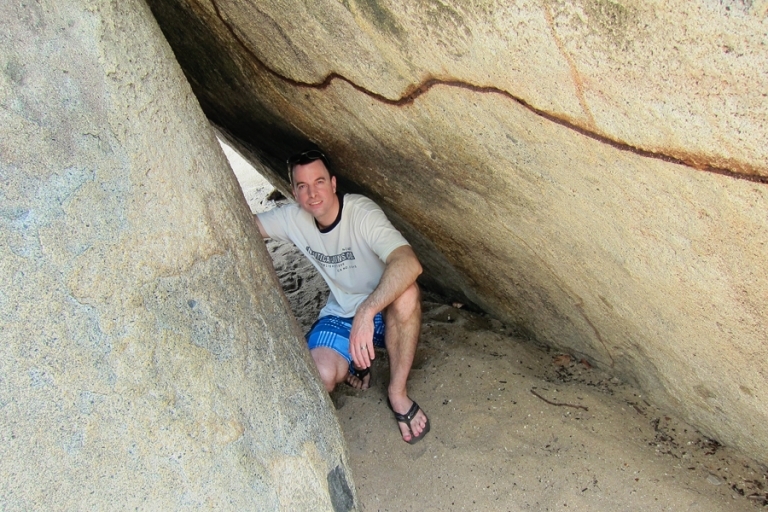 After exiting the caves, we spent some time snorkeling around the boulders off the beach and it was SO FUN. This was the moment I realized snorkeling isn’t terrifying, and it’s actually quite fun. We saw friendly colorful fish in shallow, easy to access water right off the beach. Some of the footage in this video is from The Baths (from 1:36 to 1:57), and might give you a better idea of how things looked from the inside. All the photos and this video were taken with my Canon S95 in a waterproof housing. Tortola 2013 from Susan Marks on Vimeo.